Delirious New Orleans is a book in two parts: it is a rich photo essay of under-documented sections of an iconic American city; and it is a keen analysis of how longstanding systems of race, class, and politics have created a bifurcated cultural landscape. It explores how residents of New Orleans create a "lived vernacular," the unofficial social and community landscapes amid the physical vernacular landscape of the city. Verderber documents the primary and alternative uses of neighborhood buildings, the spaces between them, and the pop-culture canvases of walls and signs, by the mostly poor and black, longtime citizenry of New Orleans. He also observes that buildings and people are often dynamic, adaptive, and responsive in ways that are not always positive or triumphant. This too is part of the lived vernacular. Verderber began his documenting project well before the 2005 hurricane season changed New Orleans forever. His volume is richly illustrated with historic photographs and images, recent photography, and analytical drawings. Part of the visual story lies in the before and after photographs that document the damage by hurricanes Katrina and Rita to many of the sites Verderber had previously recorded, and returned to following the storms. The physical and social damage wrought by the storms is but one subplot of this compelling study, however. Delirious New Orleans contains important lessons for us to take to next year's VAF conference in Jamaica. A significant part of Verderber's story is a critique of how the choices for what define heritage tourism in New Orleansundefineda once-seasonal carnival packaged into now-nightly bar crawls in the French Quarterundefinedfreezes history in a particular time and place and denies the stories of the real, living history ongoing in most of the city. This kind of tourism promotion leaves New Orleans' poorest residents out of the civic improvement equation. Stephen Verderber is professor of architecture at Clemson University and also adjunct professor in Clemson's Department of Public Health Sciences. 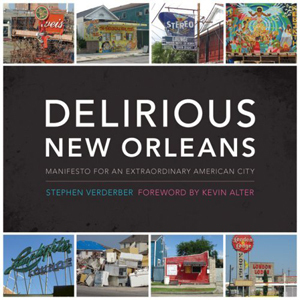 The VAF urges you to add his most-passionate manifesto Delirious New Orleans to your reading list this year. We welcome Stephen, who has admired the work of many VAF members and will now be counted as a new member.